Knowing What Stress Does to Your Body can be vital to maintaining good health. After all, motivation is important. We hear a lot about the effects of stress these days. It definitely makes you wonder about how we have decided to build up our society and live our lives. Most families are running all out from the moment their eyes open until they hit their beds – and even then most bring different types of electrical devices to their bedrooms and beds that keep their brains actively “charged” late into the night. We know this. We know that stress is not good because we can feel it! intestinal flow stopping or going too fast. We don’t like it…..but we often continue with the status quo. Perhaps you don’t realize what stress does to your body. If you had then you would do everything in your power to prevent it from having an effect on you. One way to try and reduce the impact of stress is if you buy cbd oil. But there are other methods that you can try too. Stress effects multiple systems of our bodies: cardiovascular, nervous, gastrointestinal, etc. Stress puts our nervous system into a long term “fight or flight” response. Everything is on high alert. You may think, “”Ok, so what?” Yet, staying for more than a few minutes in this state can cause serious repercussions. Causes blood pressure to rise. High blood pressure, stress on the heart = higher risk of heart attack. And yes, even people in their thirties are having heart attacks these days. This is why many people use products like TONIC Vibes CBD oil to combat the stress as well as the heart problems associated with it! Signals the adrenals to release cortisol and epinephrine. A study by Wake Forest University suggests strongly that these “fight or flight” hormones can encourage cancer cell growth. A motivation to avoid sugar as much as to avoid stress. Imagine the effects of eating high amounts of sugar while stressed! Causes Inflammation – Stronger heart beats caused by stress can lead to larger blood flow being directed to your muscles and heart. This push for more blood to be delivered can cause inflammation. Doctors are finding that internal inflammation causes a whole host of problems, one of those being a higher risk of a heart attack and stroke. Inhibits Immune System. 6 Basically, you produce epinephrine and cortisol so much that your body shuts down its response to it. Inflammation is a mechanism to help kill viruses, etc. You stop turning off that inflammation response and thus are internally inflamed perpetually….NOT good! There are lots of methods to reduce stress. Some people use a matcha tea supplement for relief while others get massages or pamper days to just relax. If you’re not sure what works best to reduce your stress then these 4 steps are things everyone should be examining on an ongoing basis. Everyone can and should, if at all possible, complete these if they are feeling stressed. Maybe this is all you need. Write things down, buy supplies, get other people working with you if you need to, delegate, and you feel great! It is definitely something that helps me. This is HUGE! A big symptom of high stress is when everything becomes high priority. I’ve been here before. I’ll literally walk in circles because I’m trying to do everything at once and nothing holds priority over another. In my mind everything has to get done. This is when you need to stop and prioritize. Do what must be done first, realize what can be done another day. It’s easy to cut out exercise when we are under stress because “We just have too much to do.” But exercise BURNS CORTISOL!! Cortisol is known to cause inflammation and eventually encourage cancer cell growth. Not only does exercise help eliminate cortisol, it also can help regulate your systems, working and relaxing muscles, causing you to be able to think more clearly and work faster than if you didn’t take the time to work up a sweat. The endorphin hormones are a big pick me up as well so don’t skip exercise when you are stressed! So true! The worst thing is that after years of feeling unwell it can start to feel normal to feel that way and you forget what it’s like to feel better. My husband and I were like this, always under stress, a million things on our plates, chronic health issues and we actually joked who would die of a heart attack or stroke first. A dark joke indeed. Then one day we just made the decision to stop the merry-go-round and get off. 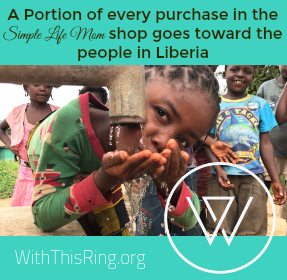 We sold or gave away the majority of our stuff and downsized to only the very important. We made a major move from one province to another and from city living to country living. My husband changed careers from a very stressful customer service career he had been in for 23 yrs to a job as a beekeeper working all day in nature. The work was hard for him at first as he wasn’t very fit but even tired and sore he has a smile on his face at the end of the day. Chronic health issues are starting to clear up. We live simply now. Our home/property is a bit rustic but we are slowly renovating as we can afford to. Our income has dropped by half and we are struggling financially but strangely enough, we seem happier and more relaxed than when we were on the merry-go-round. We laugh more and have more time to bond and really spend time with each other. People ask us how we found the courage to make such a huge change in lifestyle and honestly I don’t know. It wasn’t easy and during the process we got cold feet more than once. But there are no regrets. Not everyone can do something like that but at the very least following the steps in this blog post should help change your life for the better. The point to remember is that you CAN make changes. Need some inspiration? I came across this video poetry in another blog post and it sums it up nicely. It’s called Everybody Dies, But Not Everybody Lives https://youtu.be/ja-n5qUNRi8 Worth a listen. Connie, how I admire and respect you and your husband! It can’t be easy giving up a “good” job like that! I think that you made the very best choices in your situation! The very best to both of you, and thanks for giving me hope that I can get where I want to go, too. I am a single Grammie and have 5 acres. I still work full time, and it pays the bills, ( I still have a large mortgage to pay off before I can ‘retire’ to gardening and being self sufficient), but long to be ‘free’ and begin ‘living’ my dream, too. Take heart in the fact that you will most likely be happier and live much longer, more productive lives where you are now. Thank you for the encouragement! It sounds like you have some pretty good ideas here. Have a great afternoon! So very true, I stress out all the time of the smallest things, I just need to chill! Thank you for sharing at the Homesteaders Hop! I think stress is the underlying cause of many illnesses. Thanks for sharing this great article. For me, focusing on the character and nature of God as revealed in Scripture helps me alleviate stress. Sage advice and so important in this hectic world. Stress and sugar need to be taken out of all our lives! 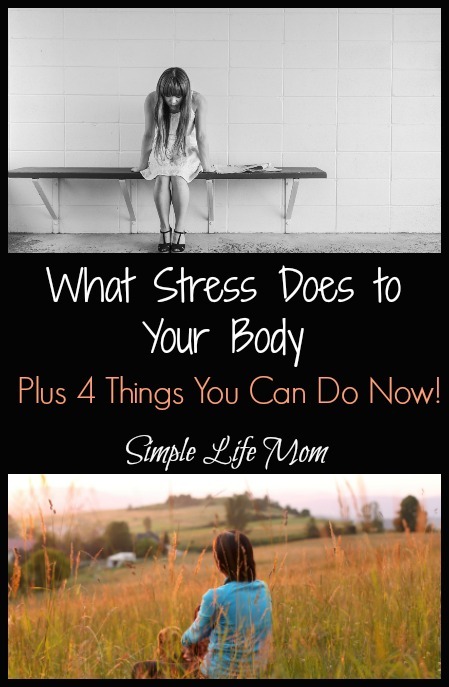 This is so true, I’m pretty good at stress reducers #1, 2 & 4, but need to get better at #3! Some causes of stress, of course, cannot simply be removed – I’ve been the caregiver for ill family members, for instance, and am now dealing with chronic illness myself. But that’s how I’ve learned to prioritize – I’ve let many things go that were, indeed, important, but were also just too much to deal with in the circumstances. And then, yes, eat right (I do avoid sugar!) move my body, and really relax – it does help. Many blessings to you Anne. I’m glad you’ve learned to cope, but I hope that you find relief from your chronic illness as well (https://simplelifemom.com/2016/05/22/20-stress-relieving-herbs-teas/). My new post on Stress relieving herbs may help as well. Herbs can give us vital nutrients and soothe our nervous system as well. Every little bit to help, right? This is all so VERY true. Stress can be a great motivator, but it can also have a huge negative impact on your health. Meditation each day helps me reduce my stress and anxiety. 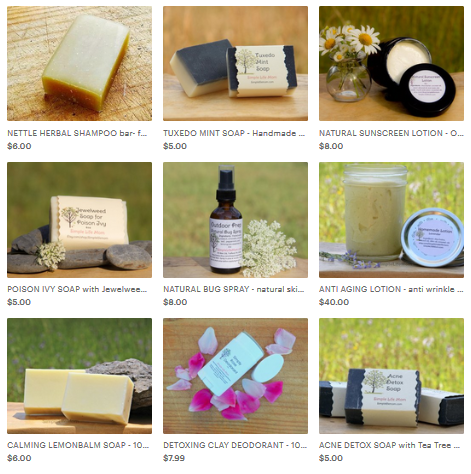 very useful post thanks for sharing with Hearth and soul blog hop. I try to stress for only one thing in my life and that’s my family’s health. 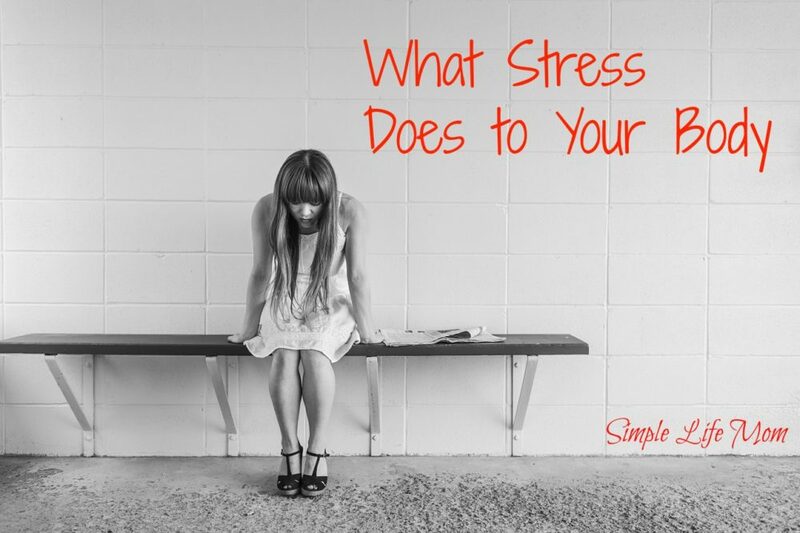 I know exactly what stress can turn you into! Everything you say it is so true! I can attest to all of this! My youngest son was born with medical problems and my stress level during his first year was through the roof. Fantastic read! Stress is something we all live with but don’t really stop to think about for sure. I love your good tips too! Thanks for sharing on the Healthy Living Link Party 🙂 We hope to see you back tonight! I went to the dentist a few months ago, sure that I had a serious tooth infection. It turns out that I had been grinding my teeth in my sleep. There’s certainly something to getting better organized and delegating as much as possible. I’m trying to get better about those things! I’ve examined our family activities and determined that we need to cut out more. It will be sad to stop doing some of the things we enjoy, but as much as we love hanging out at home with friends, it’s a good trade. It really can be hard to cut back sometimes, but our relaxed family time and the discussions we get into are so well worth it!!! We live in an age where we are always on the go, facing all kinds of challenges, ive had to learn the hard way how stress has effected me of late, I also believe it can cause leaky gut, which then cause havoc on other parts of your organs/immune system, now I’m allergic to almost everything, never thought id see this day that id be struggling with my health, a true eye opener. This is what I keep telling my husband. He never gets sick and is always in great health. Which is wonderful, but plenty of people live their lives like that only to be hit hard when they reach a certain age. I think prevention is HUGE and good habits should be started young. This is the best reason for exercise I’ve seen. I agree!! Even if I only feel like I can get out and walk, I know it’s helping in so many ways.